AUSTRALIAN motorcyclist Toby Price made ground on Dakar Rally leader Ricky Brabec during the latest stage in Peru, though his Red Bull KTM Factory Team teammate Sam Sutherland has emerged as a title threat. Price, who is managing a pre-race wrist injury, trimmed a minute off his deficit to the American during the fifth stage between Moquegua and Arequipa to trail Brabec by three minutes and 21 seconds. However, Sutherland claimed the stage, despite stopping to help a rival, and jumped to second overall, relegating Price a place to fourth on the general classification, 3min21secs off the pace. "It was a really tough day for me today. My pace today was good but I cased out on one drop and that put a lot of strain through my wrist again," said Price, who finished the 519km stage in eighth spot. Sutherland, the 2017 champion, claimed the stage after officials subtracted the more than 10 minutes he spent assisting Paulo Goncalves, who sustained head and hand injuries in a severe fall. The Brit is just 56 secs behind Brabec with five stages remaining. Goncalves' accident and withdrawal from the rally represents a new setback for Honda, whose top rider, Spain's Joan Barreda, was forced to pull out of the race in the third stage when he became stuck in a basin. Racing was delayed for nearly two hours due to thick fog on parts of the route that made it impossible for the helicopters supervising the competition and filming footage for television to fly. The Frenchman beat Al-Attiyah by more than 10 minutes to move up to fifth overall, 40 minutes off the lead. Two-time Dakar winner Al-Attiyah leads Loeb's compatriot Stephane Peterhansel by 24 min 42 secs. 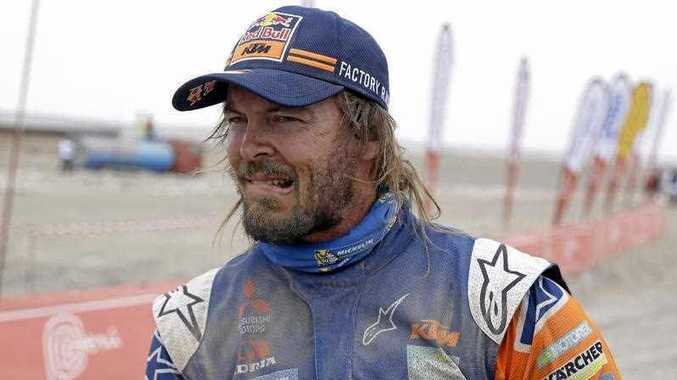 The rally, staged in South America since being switched from Africa in 2009 for security reasons, now has a rest day.